What is your journey to date? I was working in a large electrical company in China, when I decided to change my life. 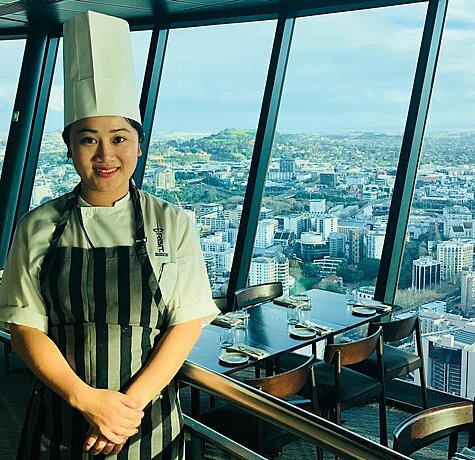 I left China to become a chef! I arrived in Auckland and went to the University of Auckland English Language Academy to learn English. My English pathway led me to university study, but my passion for cooking called me to NSIA. Why did you choose NSIA for your cookery and patisserie course? I chose NSIA as I had heard it was a really good cookery school and it certainly taught me a lot. So I’m very happy with my choice. I always cooked at home, and I loved to design my own special dishes with different flavours and cooking methods. When I came to New Zealand I wanted to be a chef and create memorable dishes. It also gives me great satisfaction seeing people enjoying my food. In my career to date, I have over a year and half of experience working in professional kitchens. During my time there I have learnt valuable skills such as time management and working under pressure. What are the key skills to be a good chef? Enthusiasm about cookery, and the love of food! But being punctual, hardworking and reliable. Also the technical side, plus time management and creativity. How has your course at NSIA helped you? Learning the cooking techniques and skills to make me the best I can be. 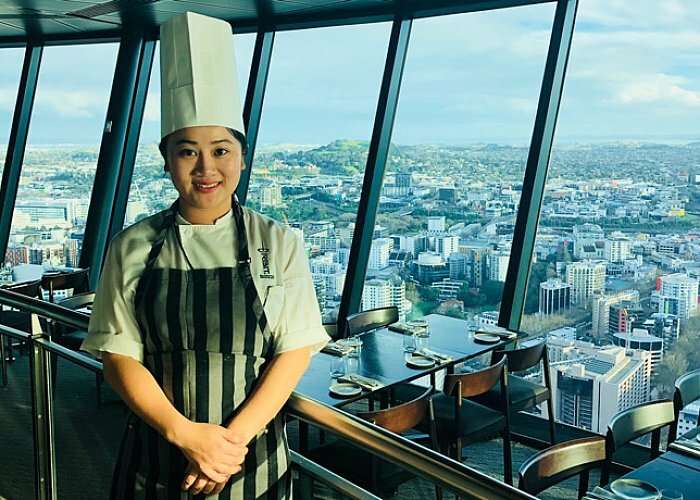 The Cordis Hotel, which was formerly the Langham Hotel in Auckland, as a Commis Chef. I was completing 10 days work experience when an opportunity arose which I applied for. I was thrilled to be successful. Lots of preparation, it’s very important to know exactly what you’re doing. I also help with the dishes we serve to customers. Learning lots of things from the kitchen. It is a really big kitchen. Did your course at NSIA live up to your expectations? Yes. In every single way, as it has given me a really good foundation for cooking, but also made me improve so much that I will have a very successful career in cooking now. How did you feel when you were coming to NSIA? I was really excited. I couldn’t wait to get stuck into cooking and learning. The practical without doubt. I love to be busy and it really prepared me well for life in a busy kitchen. Lots of skills, right across the full spectrum. How did your NSIA training help you? Understanding and perfecting the basics, and applying the knowledge from my training has helped me adapt to working in a busy kitchen. If you want to do it, you can. I have converted the skills and knowledge I learnt, to a real kitchen and it has helped me improve and be on the path to being the best I can be.